Bargain Win10 devices - laptop, tablet and phone - PC Buyer Beware! January 2018: The light, slim Fusion5 T50 lapbook laptop comes in two versions, both Windows 10 devices – 10.6-inch (£150) and 14.1-inch (£215) models that provide a 1920×1080 IPS Full HD display (not touchscreen). The 14.1-inch model with 4GB of RAM memory, 64 GB of eMMC storage and Windows 10 Home 64–bit version is particularly good value. Here is the link to it on Amazon UK. Read the customer reviews (666) that apply to the 10.6-inch and 14.1-inch models, but there is an option to choose the reviews for the 14.1-inch model. Note that eMMC storage is not and SSD drive, it just the type of flash memory used in many tablets and smartphones, which can store and run Windows 10 and applications, such as Microsoft Office very well. – Intel Baytrail quadcore processor – This is a forth-generation Intel Atom Baytrail 3735F – GPU processor, designed for tablets, that has four cores (Quadcore), each running at 1.92GHz. It integrates graphics, memory, and I/O interfaces into one platform, providing outstanding performance and power efficiency. – 2GB RAM memory and 32GB (10.1-inch model) or 64GB (14.1-inch model) of on-board eMMC storage that can be expanded up to 128GB with a Micro SD card. – Windows 10 Home 32-bit version, which runs well on 2GB of RAM memory. A 64-bit version of Win10 would require a minimum of 4GB or memory. – Built-in Wireless 802.11n (802.11b/g/n) Wi-Fi. – HDMI: support, mini HDMI – Camera: front 0.3 megapixel camera. – USB port. – The laptop is too thin for a CD/DVD drive, but external USB optical drives are cheap. Software will have to be downloaded or installed using a USB flash drive. A Fusion5 10.1-inch Google Android 2-in-1 laptop (£125.00) and tablet (£100.00) are also available that run Android 5.1 Lollipop – an old 2014 version of Android. Note that Android devices should be provided with updates to the latest version. If not they become security risks. April 2017: The light, slim Win10 Fusion5 tablet comes in three versions – 10-inch, Win10 32-bit tablet, 2GB RAM memory (£135) 10-inch Win10 64-bit, 4GB RAM memory (£300) and the 64-bit tablet with a docking keyboard and case (£330.00). 10-inch tablet – Intel Atom Z3735F 1.83GHz quadcore processor with integrated graphics, 2MB cache. 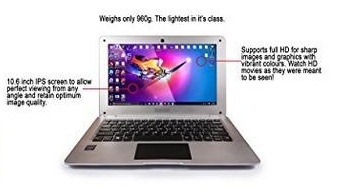 – 2GB RAM DDR3 memory – 32GB SSD drive (part of capacity holds Windows 10) – Up to extra storage 128GB via the Micro-SD slot card available but not included – Dual cameras (2 megapixel front, 5 megapixel rear) – Wireless 802.11n (802.11b/g/n) Wi-Fi and Bluetooth G-sensor – HDMI port that allows connection to a TV/monitor using an HDMI cable. Pre-installed Microsoft Word, Excel and PowerPoint Mobile. In the Box: tablet, AC adapter, USB cable and user manual. 12-month return-to-manufacturer warranty. 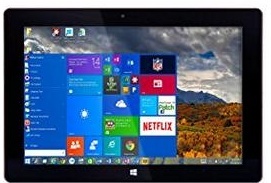 Note that, provided with enough storage space, Windows 10 tablets function as a normal desktop or laptop PC, unlike Google Android tablets that cannot run office and other applications, just apps. Moreover, all Windows 10 devices receive updates automatically, unlike Android devices, most of which do not. With many Android devices, you are stuck with the version that they came with, therefore, you should check if updates are provided before making a purchase. If you are new to computers, updates fix bugs and critical security flaws. “This is an amazing machine. Pin-sharp screen, to which the suppliers have attached a protective screen. Very fast – I have Office 365 loaded on this and on my Dell desktop, without any noticeable difference on performance. All apps loaded faultlessly, and readily found the wireless network. Plugging a USB four-way adapter into the proper full size USB port means that I an use all my peripherals simply plug and play. “Instruction leaflet is the usual bizarre Chinglish, and in a font size so small you need a magnifying glass to read it – but as you all need to do is to put the machine on charge for seven hours, and then switch it on that hardly matters – everything else is intuitive to anyone who has used Windows or iOS. “Support from UK supplier F5CS is exemplary. Query on [Windows 10] Product Key was responded to and resolved within minutes – at after 10:00 pm on Christmas Day. “Any quibbles? There is no kickstand – I suggest you buy a Daffodil IPC410 Smart Phone and Tablet Stand, currently £2 on Amazon. 10″ screen size is fine – but, as it can do everything a desktop can, I will be the first to buy a 13” version when it comes out. A smartphone that runs the mobile version of Windows 10 is really a very powerful miniature mobile computer that can run Microsoft Office applications and a choice of 350,000 apps available from the Windows Phone store. Lumia phones come with the latest Windows Phone features pre-installed, including the full Microsoft Office suite (Word, Excel and PowerPoint). Note that all phones that run Windows Phone receive the latest updates, unlike most Google Android phones, very few of which receive the latest version of Android. – 4G connectivity, a powerful Snapdragon 400 1.2 GHz quadcore processor and 1GB RAM memory. – 30GB of private cloud storage with Microsoft OneDrive (requires an outlook.com or other Microsoft account). – 5-inch HD screen and wide-angle, HD 0.9 megapixel front-facing camera, 8 megapixel rear camera with LED flash. – MicroSD card slot for extra storage space. 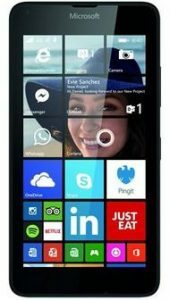 – Windows Phone 8.1, but can be upgraded to Windows Phone 10. – “The latest Windows experience is coming to Lumia smartphones” that run Windows Phone 8.1 – Lumia 1520, Lumia 930, Lumia 830, Lumia 735, Lumia 640 XL, Lumia 640, Lumia 635, Lumia 535 and Lumia 435. – USB 2.0 port and Bluetooth 4.0. – New price – £160 in April 2017. May 2015 – “Security and regular system updates were important factors in the choice of my next phone. Lack of system updates are a major problem for Android devices. My Galaxy Note stopped receiving updates after just over a year, and my LG G-Pad tablet still hasn’t received the promised Lollipop update [released November 12, 2014] despite still being a flagship device. Sure, I could get a Google branded Nexus, but I want the capability to upgrade my phone’s memory. “So when Microsoft announced the new Windows phone range with updates “for the lifetime of the device” I did my research on the new Windows Phone features and ultimately bought this phone. 1. – Samsung updates – Does Samsung update all of its Android phones and tablets to the latest version? 2. – Protect yourself when using public unsecured wireless networks in shops, restaurants, hotels, libraries, etc.